With over 1.6 billion monthly active users, Facebook is without a doubt the largest online social network and one the most popular site on the internet today (loosing first place only to google.com). With its never-ending stream of innovations, Facebook continues to evolve with each day, enabling you to remain connected with your friends, family, co-workers of even fans with more power and ease. New users of Facebook quickly learn that its masterful UI enables them to quickly find their long lost companions, find soul mates, school and university friends, work colleagues and more. With search engine that connects more than billion of users, you can instantly surround yourself with friends and enter into conversation about your and their interests, no matter how far they are! The biggest social network! 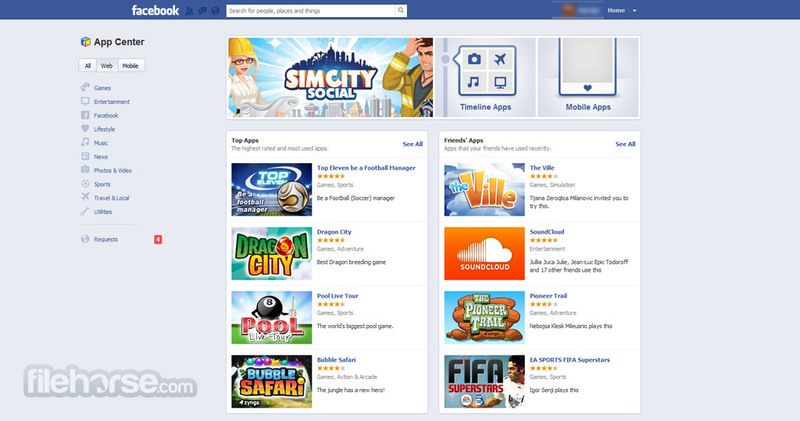 With the power of uploading photos and videos, creating albums, commenting on any news article you see, send private messages, and wide array of innovative applications or online community driven games, Facebook represents home for your online experience and starting point for exploring world wide web. World’s most popular destination for connecting with people! The most popular social network in the world was born in 2004, and ever since then it has managed to expand to being the second most popular website in the world (just being the Google.com). With more than 1.6 billion active monthly users monthly, this incredibly large gathering place of people is now considered to be essential destination for everyone who likes to keep connections with their loved ones, friends, family, school friends, co-workers, business partners, potential customers, and general internet population. With state of the art tools for discovery, sharing, promoting, communicating, real-time chatting, collaborating and enjoying various forms of entertainment, Facebook represents one of the most influential websites in the world. Accessible from your internet browser on every PC, Mac, Android, Apple iOS and Blackberry device, or directly from a dedicated app for modern portable devices (smartphones and tablets), Facebook represents the best place you can interact with the entire world. Facebook is a state of the art cloud-powered social network website that enables its users to share with each other their daily activities, internet content, various forms of multimedia and other content, all from the interface that is easy to use, intuitive and fast. 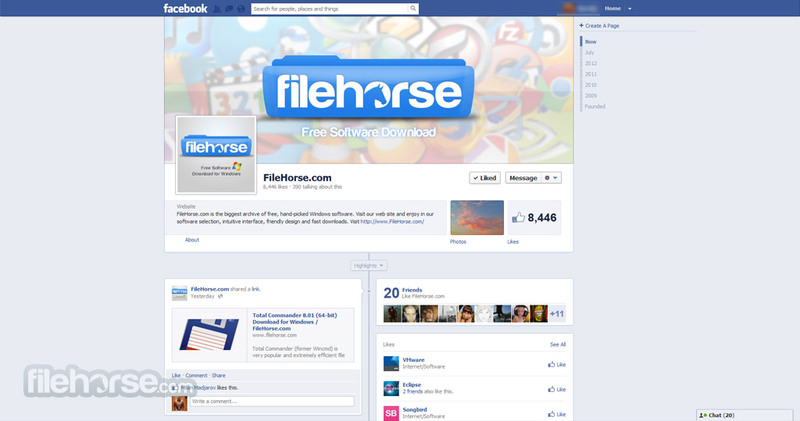 When you sign in to your account, you will be presented your profile that you can fill with your own content, and where you can also receive real-time breakdown of Facebook activity that is gathered from your friends or people who have signed up to receive updates (those can be real people, or pages that are maintained by businesses, brands, websites, and popular entertainment personalities). What you can share with the world using Facebook? Almost everything you like – short updates about your current activity, long-form discussions, single photos or entire galleries, music, video, events planning, and every your posts can be a talking point for your friends. The biggest social network! In addition to simple sharing of content and communication, Facebook has in recent years become a very popular place where people play social video games that are specifically made to take full advantage of the Facebook’s large community and tools for promoting content. 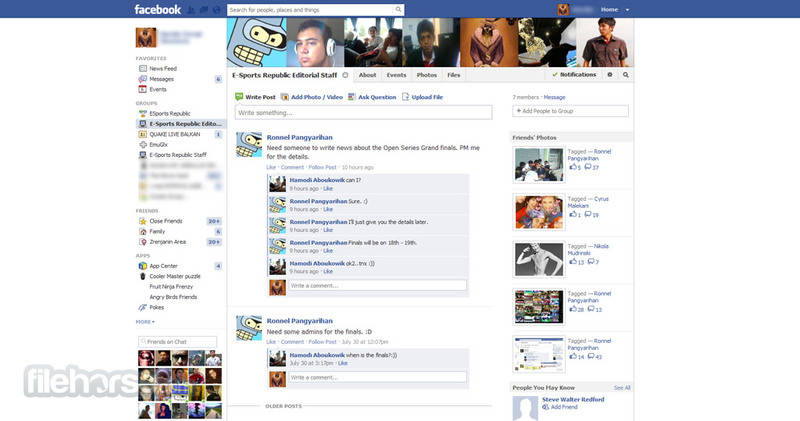 Interface of Facebook is presented with simple white and blue design that can be easily used by everyone. Central place is dedicated for the list that is filled with activity of your friends, on left is a bar filled with shortcuts to all the most important Facebook features (Photos, Events, Messages, Grpi[s, App center, etc. ), on the top is the search bar (you can search by name, photos, music, movies, games, etc.) and notification bar where you can see how if some has mentioned your or commented on one if your posts. Facebook has managed to increase its popularity to these incredible heights not only because of its innovative tools and features, but also because it is 100% free registration. All that you need to register on Facebook is a working email address and a little time to fill out basic credentials that will be used by Facebook The biggest social network! powerful server to recommend you to other people you may or may not know. There are no registration costs, subscription fees, in-site purchases that enhance its basic functionality, and account cannot expire. As the most popular social network in the world, Facebook is a online destination that you simply must use if you want to remain in real-time touch not only with your friends, family and co-workers, but also with celebrities and companies whose updates you desire to follow.